Property Size 600 sq. ft. When you arrive at HUMMINGBIRD HIDEAWAY let the serene sounds of small babbling brooks, the smell of a fresh ocean breeze, and the coolness of the dappled shade amongst the forest of stately palm trees fill ALL your senses. At once you know you’re in for a very special vacation found only in the unique rhythms and charm only found in San Clemente! 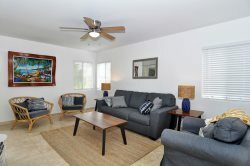 HUMMINGBIRD HIDEAWAY is a charming 1 BED / 1 BATH single level condo located on the second story overlooking one of the two beautiful community pools. This hillside retreat is right at 600 s.f. and is set among the beautifully landscaped condominium complex ‘Vista Pacifica’ in San Clemente, California. Countless streams with waterfalls, two pools with community spas, and numerous walking trails with forever vistas all surround HUMMINBIRD HIDEAWAY making this retreat a very rare find. HUMMINGBIRD HIDEAWAY sleeps 4 comfortably. There is a queen size bed in the master bedroom and a queen size sofa bed in the family room. The bathroom includes a single sink, toilet, and combination tub / shower unit with a stackable washer / dryer inside the bathroom. HUMMINGBIRD HIDEAWAY is perfect for a single family on vacation or a short work stay. The kitchen table expands to seat 4 to 6 or can be folded down for just 2. There is a completely covered patio overlooking the pool which also provides a wonderful space for outdoor dining while enjoying one of many of our iconic California Sunsets. The OPEN FLOOR PLAN allows great circulation between the dining area, patio, and family room. Plenty of counter space, serving bar, a double sink, and unhindered views to the hillsides and slopes beyond are just a few of the special features. Some of HUMMINGBIRD HIDEAWAY’s other amenities also include a detached single car garage, wireless internet, and plenty of uncovered guest parking. There’s PLENTY to do and see when visiting HUMMINGBIRD HIDEAWAY! Our temperate climate is great for many outdoor activities including hiking, biking, golf, tennis, basketball, fishing, horseback riding, sightseeing, swimming, snorkeling / diving, boating, sailing, water skiing, surfing, windsurfing, parasailing, jet skiing, boating, and rafting. For all you ‘indoor’ types there are ample shopping opportunities. Within a 30 minute drive in either direction you will find the world renowned South Coast Plaza, Irvine Spectrum, Fashion Island in Newport Beach, and a slew of Outlet Malls in Carlsbad and Oceanside. There are live theatres, cinemas, museums, petting zoos, and much, much more. ‘NORTH BEACH’ in San Clemente at the end of Avenida Pico is the closest beach amongst many local beaches – it’s only a 5 minute drive down the hill! Come Explore San Clemente! We look forward to having you as our Guests!